"Hi, is there any way to partially restore iPhone? I only need to restore my messages and WhatsApp messages in my iTunes backup not my whole backup. Any suggestions please! BTW I use iOS 12 for now." Many users have enquired about partial iPhone restore. Plenty of iPhone users generally use iTunes in order to back up their iPhone and restore from backup. Since iTunes doesn't support partial restoring of iPhone, a lot of the users find it a little inconvenient when they want to restore a specific app or some apps. On that account we will now introduce an iTunes alternative that will support iPhone partial restore function and you will be able to flexibly restore your iPhone backup, even if it is for iOS 12. To make partial iPhone restore possible without any complication, you just need iMyFone iTransor. 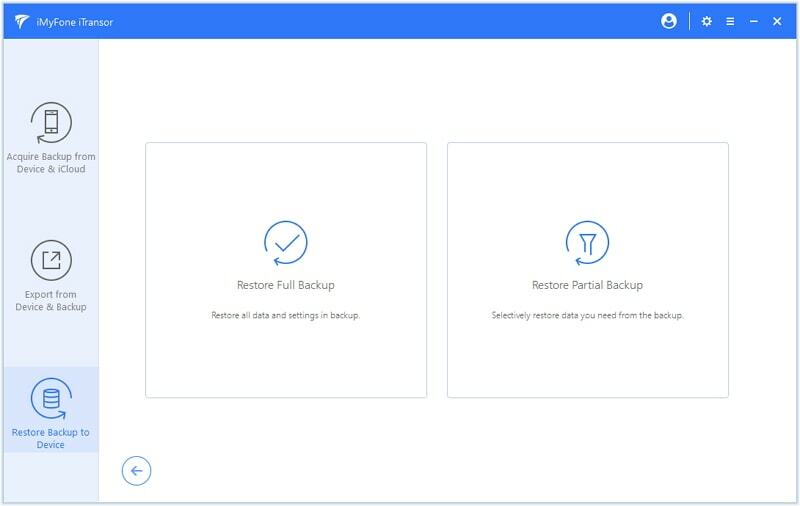 It is a flexible backup and restore tool that provides users the flexibility to save or restore their data fully or partially. This is the most recommended tool that is fully compatible with iOS 12 and the latest iPhone series i.e. iPhone 8/8 Plus/X. Restore a whole iTunes, iCloud or iMyFone backup or just restore certain types of data in the backup. 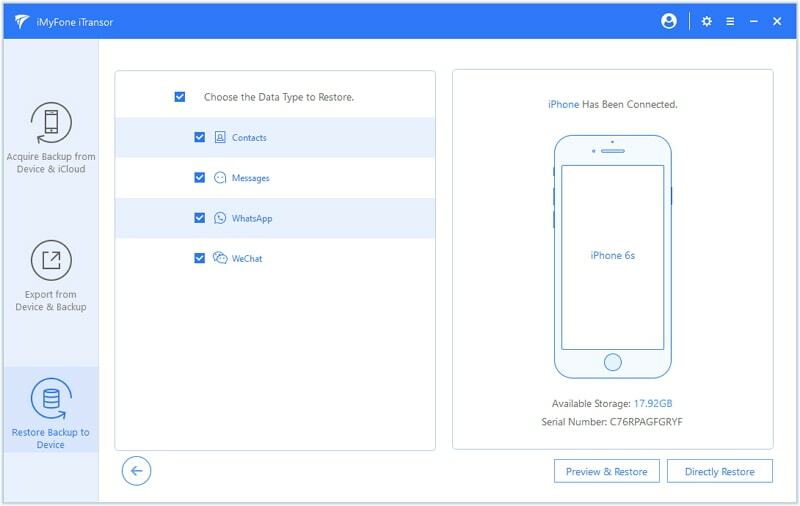 Restore contacts, WeChat, WhatsApp, messages backup without affecting the other data on your iPhone. 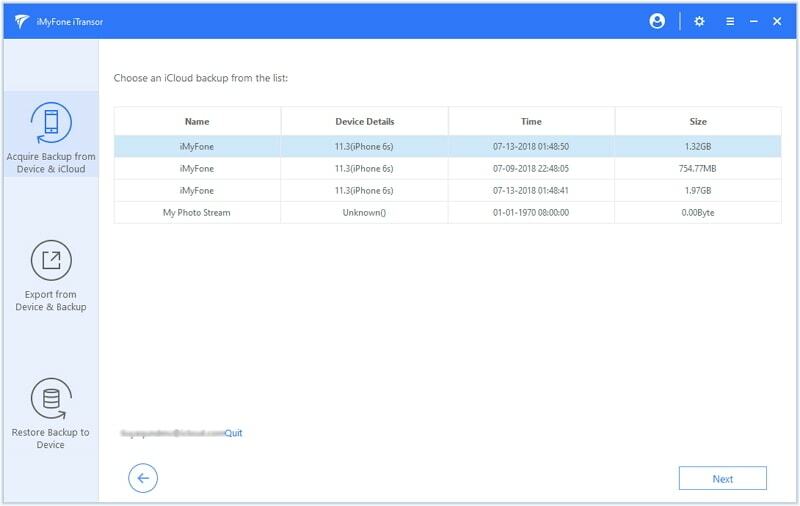 Backup your whole iPhone or just backup the contacts, WhatsApp, WeChat or messages on your iPhone. Extract 18 types of data from your iCloud/iTunes/iMyFone backup or iOS devices. Here is the guide on how to partially restore iPhone from your iTunes backup using iMyFone iTransor. Step 1 – Download the iMyFone iTransor from its official website and launch the software post installation. Now, connect your iPhone via a lightening cord to the computer and hit on the "Restore Backup to Device" tab available in the menu panel on the left. the software will automatically detect all the backups, including your iTunes Backups. Step 2 – After selecting the iTunes Backup file from which you wish to selectively restore iPhone and hit "Next". Then you need click "Restore Partial Backup" and "Next" to proceed. Step 3 – From the upcoming interface, you will be asked to choose the data types that you wish to restore. Select the desired data types and hit on "Preview & Restore". Note: You can choose to directly restore the data in iTunes backup if you are sure the content in the backup. Step 4 – All your selected data will then be loaded on the software window for your preview. Once you are done previewing your data, hit on "Restore" to choose "Merge" or "Restore". Step 5 – Wait for some time which depends on the size your data until the restore process is done. 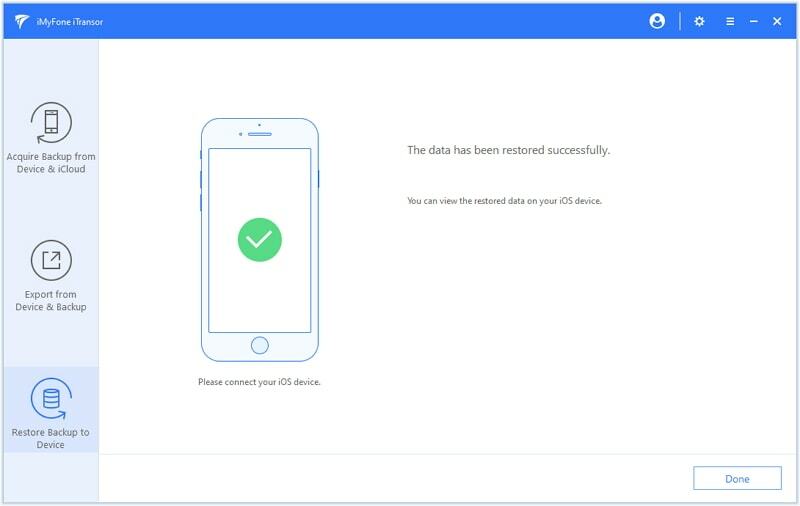 Step 1 – After installing the iMyFone iTransor from its official website, launch the software on your computer and connect your iPhone to it using a USB cable. Hit on the "Acquire Backup from Device & iCloud" tab on the left menu panel. Click "Download iCloud Backup". 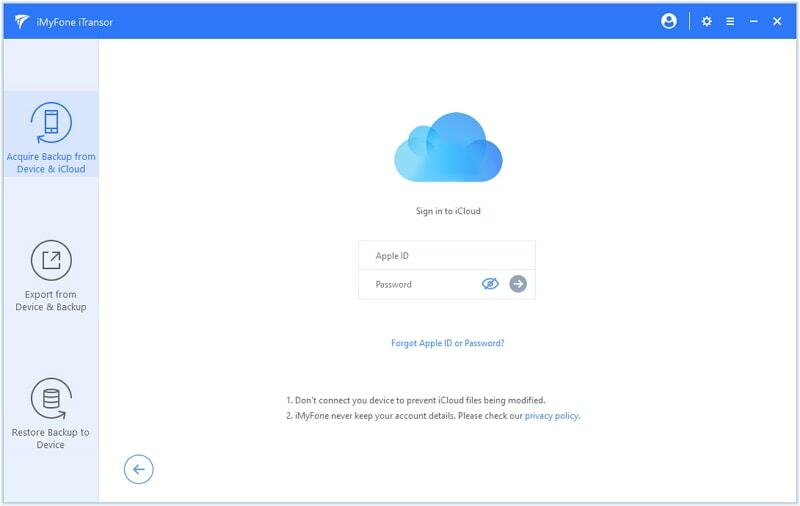 Step 2 – Now, punch in your iCloud username and password in the respective fields and log into your iCloud account. Step 3 – You'll now be asked to select the iCloud backup that you wish to restore to your iPhone. Hit "Next" after making your selection. Step 4 – iTransor will start the download the iCloud backup and it might take some time which depends on the size of the backup file. You will be noted after the backup is downloaded. Choose "Restore Data in the Backup." The following steps are pretty similar with how to restore partial data from iTunes backup. You just need to choose the downloaded iCloud backup and proceed. iMyFone iTransor can also be used to back up various iOS devices. 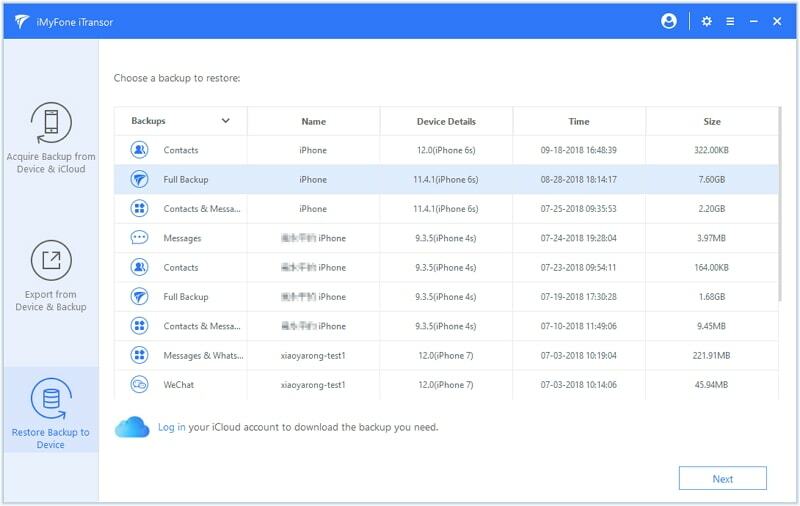 You can make a separate backup like WhatsApp backup, Messages backup, contacts backup and WeChat Backup using this tool, no matter iOS 12 or iOS 9 is running on your device. These backups can be restored more quickly and will not take large space on your computer. Besides, the previous backup you made using iMyFone iTransor will not be overwritten by the new backup. Unlike iTunes, you can store all the backups made by iTunes on your computer. 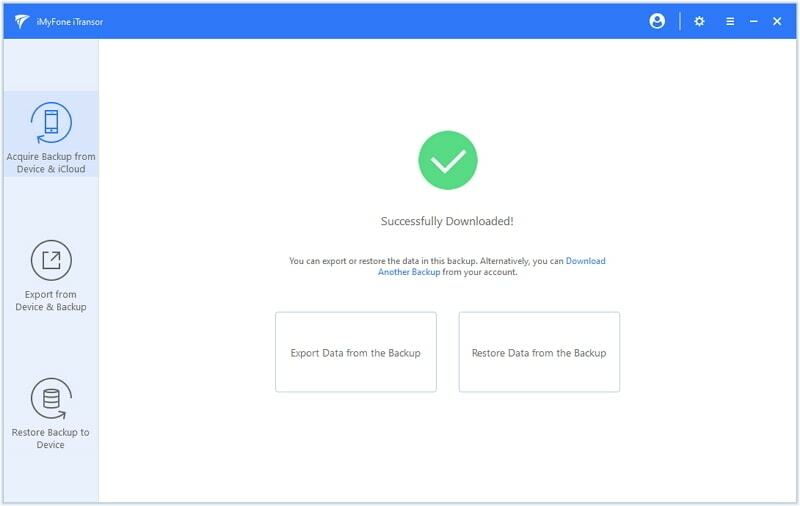 Therefore once you want to restore the backup, you just need take several steps and wait for a short while for the data to be transferred to your device. Step 1 – Launch the iMyFone iTranspr after installing it from its official website. Now, connect your iPhone to your computer via a USB cable and hit the "Restore Backup to Device" tab on the left menu panel. 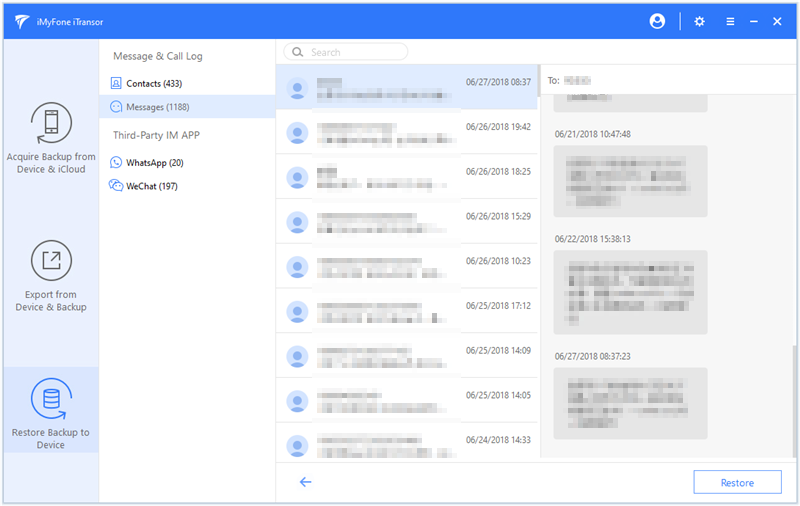 Step 2 – Next, the list of your entire backup files (including WhatsApp, Messages, WeChat backups) will be loaded on the screen. Choose the preferred backup file like Message from the list and hit on "Next". Similarly, if you wish to restore WhatsApp, contacts, or WeChat data, select their respective backup files and proceed to the next step. Then just click "Directly Restore" on the next screen. If you want to confirm the messages data in the backup, you can also choose "Preview & Restore". Step 3 – The software will now scan your backup file and list its entire data on the screen. Preview your messages and hit "Restore". 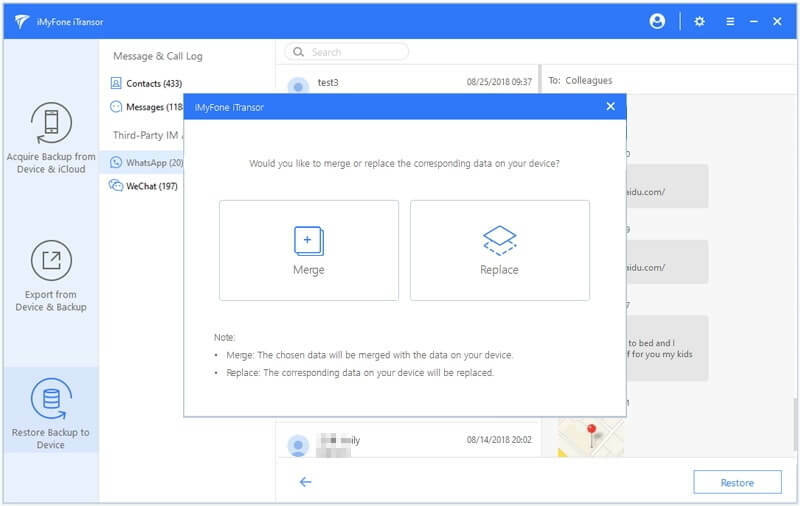 You need to choose to merge or replace the messages on your device with the messages in the backup. Click what you need to start the restore process. That's about it, within a while all your messages will be restored to your iPhone. All in all, iMyFone iTransor is not only capable of restoring backups fully or partially from the backup files made with this software but also is efficient enough to partially restore iPhone from the iTunes or iCloud Backup files. We now hope that you have got the solution for your query and can partially restore your iPhone with ease via the recommended tool iMyFone iTransor. If you use iOS 12, you don't have to worry, neither. The program is compatible with iOS 12 and all the earlier versions.